Hive Mentality / Year One With The Ringers Shop Bees — Ringers Landscape Services, Inc.
We first started working with The Smart Farm of Barrington in 2011. We were inspired by their commitment to growing organic food for local food pantries, and we looked to become involved in their mission however possible. The prospect of getting involved in beekeeping was obviously an intriguing one and we jumped at the opportunity. We struck an agreement and decided that Smart Farm would purchase the equipment and bees, and we would manage the hives at our shop in exchange for half of the honey harvest. We happened to have the perfect location at our shop in Fox River Grove, right down the street from Smart Farm’s hoop house and gardens at Good Shepherd Hospital. In March, we set up the hives and installed 40,000 bees into our four hives and never looked back! With the used equipment we received, many of the frames were already drawn out (had the combs built) and some even had honey. 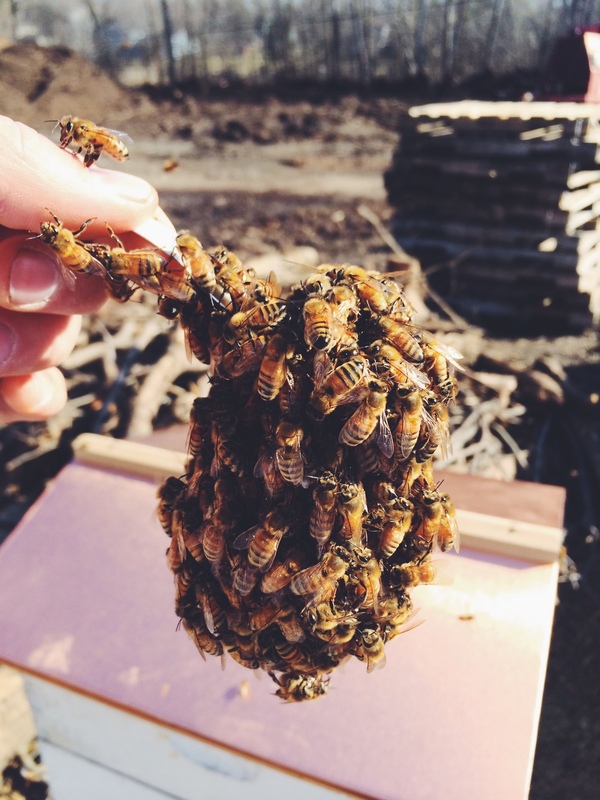 This gave our bees a great head start, and they were able to focus their energy on building their populations and honey reserves as soon as the nectar started flowing. Most first year hives are not expected to produce enough surplus honey for harvesting. We ended up with 15 gallons! If all goes well this winter, next year should be even better, now that our colonies are well established. Our bees were much more docile in the start of the season - We wore little to no protective equipment when first working with them. Generally, they are much more concerned about going about their daily tasks and social interactions. Once they built their honey supply they became much more protective and aggressive to the point where full, air tight suits were required. While you can sneak a little honey here and there throughout the season, Labor Day seems like the target weekend for the full harvest. Soon after, they will begin to uncap and eat their honey reserves. Extraction day was intense. 5 hrs was spent getting the frames out and away from the bees + another 6-8 extracting and jarring. Definitely a messy operation! It’s a lot of work! Feeding them in the early spring and late fall requires mixing up a 1:1 ratio of sugar to water mixture. We went through almost 150 lbs of sugar this year! Setting up all the equipment and general maintenance can also be very tedious. We decided that 5 hives would probably be our maximum for some time. The act of beekeeping can be as simple or complicated as you want it to be. There are lot’s of different opinions, methods and setups, all of which seem to work. As with most new endeavors, it's about forming your own experience and learning from it. Sharing your experience (as we are here) is half the fun. Having come from a large variety of sources (many of your backyards!) our honey would be categorized as “Wildflower” honey. Its color can vary from very light to dark, and flavors can range from light and fruity to tangy and rich, depending on the mix from the different seasonal wildflowers. The trick to keeping bees is getting them to successfully overwinter. While honey bees are extremely cold hardy, they do stand a chance of starving during the later winter months. Surprisingly, sometimes a consistently cold winter is better than a mild one because the bees remain less active. The more active they are, the more food reserves they will consume before the first nectar flow, and the more likely they will be to starve. One other major concern during the winter months is moisture. As the bees cluster around the queen in the center of the hive, they generate friction which creates heat. This "shivering" maintains the hives temperature around 98 degrees. If completely trapped, the warm moist air produced will condense on the top of the inner cover of the hive and eventually fall as a cold rain on the cluster. This can result in serious winter losses. Fingers crossed! To us, the act of keeping bees has become a symbolic one. We are helping to foster an entire society of creatures which have found a way to sustainably utilize, and at the same time benefit the world around them. Their complex social lives and sense of community are a model for teamwork, and selflessness. We've come to realize that honey bees are the true essence of sustainability and have inspired our company in ways we never imagined. We are currently working on a short booklet which will include more information on all things honey bee related as well as recipes, fun facts, and more photos. This booklet will accompany our jars of honey, which will be available for purchase (with all proceeds going to The Smart Farm) this spring. Stay tuned!